There’s something to be said for spending a lazy summer day immersed in a gripping intense story, with a pitcher of something cool by your side and housework and other demands of daily life put on a standby mode. *sigh* summer was meant to be spent this way, not doing yucky things like work or housework or even keyboard work. Don’t you agree? Well, talking of books, there are summer giveaways going on and an exciting one is just a scroll down away. Check out the Addictive Summer Reads blog hop. A lot of cool giveaways await you and what’s more, prizes from the Addictive Reads authors total over a $100 in gift cards. An awesome range of discounted and free books from a variety of genres make it an interesting mix. The Blog hop is from 27th – 30th June, so make sure you don’t miss it. 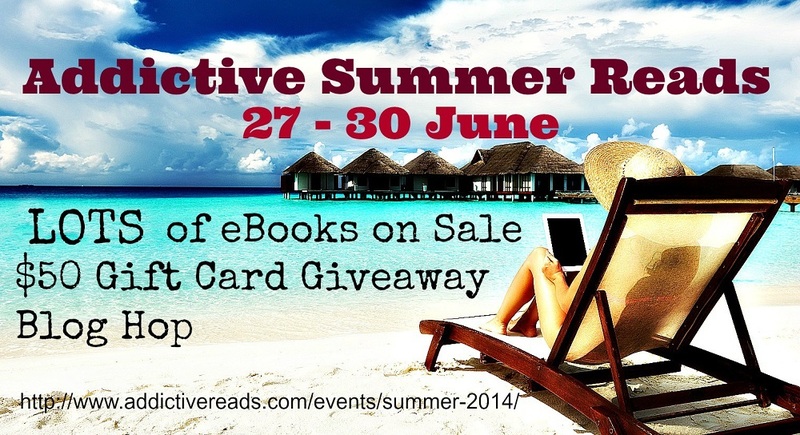 Here’s the link http://www.addictivereads.com/events/summer-2014/ Check it out. In my news, I’ve been working on the final edits of Tahir and Samara’s story. I’ve been getting great input from writer friends and it makes me realize yet again that anything you do is never just your own effort but many many people have their input in making your project – dream- come true. A thank you just doesn’t seem adequate but that’s the only way to express what I feel, so a big thank you. You know who you are. Wishing all of you a cool summer. Wish me luck for the forthcoming launch of my book. It’s still some time away but I can use all the wishes I can gather both for the psychological energy boost as well as to make positive all the random factors in universe which watch over things. Here’s another offering for the #sexysnippet initiative of the Nuthouse Scribblers. This one is from Samara’s pov as she gets too hot under the collar in the elevator with Tahir. “Chin up and bear it, Samara. And for God sake don’t let him see it. Which was about as easy as the research for potential sites for factories she’d finished compiling for him this morning. The very thought of that gaze today made her go hot and cold. She couldn’t be in the elevator with him without getting all jumpy inside. A five-minute break in her workday had her imagining herself in a leather mini and six inch stilettos, swaggering over to tip a glazed eyed Tahir back in his chair and trap him. Something in the question made her cheeks heat up. ‘Chocolate.’ She blurted. On whom? What the – The rough demand made her collar tie feel tight and her hand immediately went to it as though to loosen it. She had an image of him – shirtless – as the Samara in mini and stilettos dipped a brush in brown liquid and smoothed sweetness over his golden skin. Chocolate and him! Swoon. A lethal combination.